Here is the second of a two-part article on operational amplifiers (opamps). 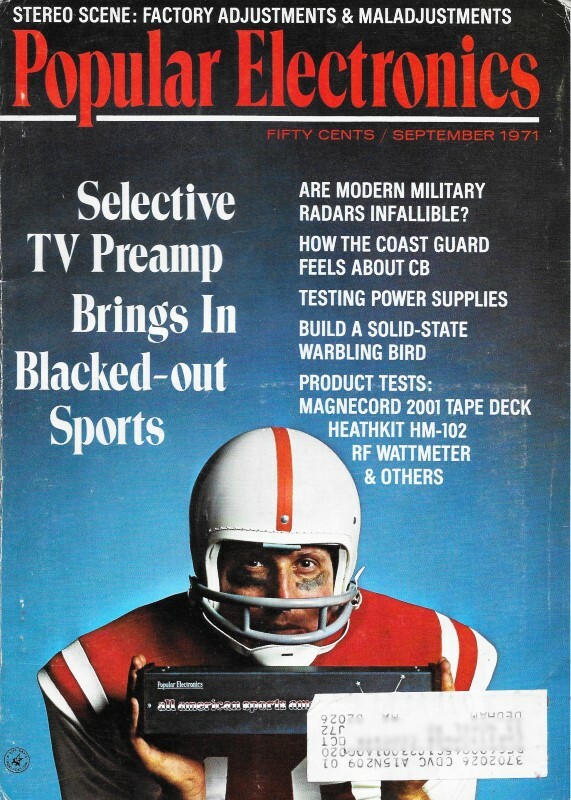 Part 1 appeared in the August 1971 issue of Popular Electronics, which I have and will post soon (it still needs to be OCR'ed). Fortunately, you don't need it to find Part 2 useful. Barely half a decade had passed since Bob Widlar introduced his μA709 integrated circuit operational amplifier. Clunky attempts at vacuum tube operational amplifiers were introduced in the 1950's, but they were not overly popular. 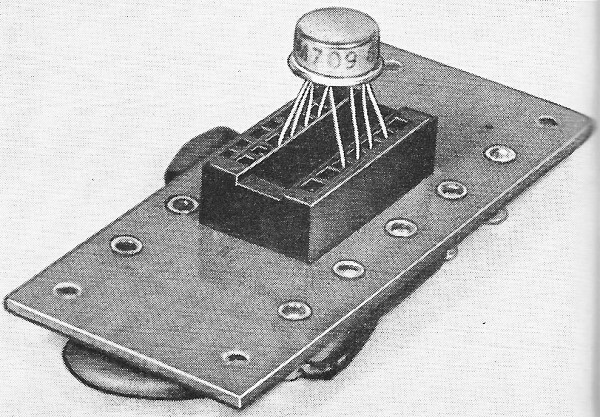 Early bipolar junction transistor opamps offered a significant reduction in size, weight, and power consumption over tubes, but did not have as high of an input impedance, had a lower gain-bandwidth product, and handled much lower power levels, which relegated their use to IF and baseband circuits. Improvements came rapidly, however. JFET and the MOSFET implementation soon raised input impedances into the megohm levels, but it would be a couple decades before frequency and power levels saw a significant increase. In the first part of this article, we discussed the "perfect amplifier" and its characteristics. However, there is no such thing as. a perfect amplifier and we must work with things that exist in the real world. So, how about applications for the real operational amplifier? Figure 1 shows the characteristics of one typical low-cost op amp (Texas Instruments SN72709N), which is a member of the famous 709 family. This device has an open loop gain of 50,000, an input resistance of 250,000 ohms, an open loop output impedance of 150 ohms, and one microampere input offset current with two millivolts offset voltage at the output. 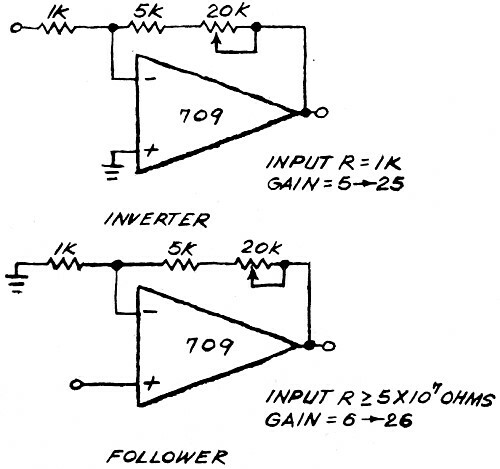 These are typical specifications for most 709 op amps, regardless of manufacturer. The best way to experiment with an integrated circuit of any kind without damaging it in soldering and desoldering is to make up a breadboard similar to that shown in Fig. 2. Suitable solder terminals are mounted on a piece of plastic and the IC is attached to the board with adhesive with its leads up. Each pin of the IC is then connected to one of the terminals. Each terminal is identified as to pin number or function, and all external components and circuits are hooked up to the appropriate terminals. Fig. 1 - Characteristics of a typical operational amplifier. This one has a gain of 50,000, an input impedance of 250,000 ohms, and a 150-ohm output. Fig. 2 - This simple breadboard approach may be used to connect up an op amp. The layout below shows a circuit fully wired. Fig. 3 - If you mount a dual-in-line socket on the breadboard, it can be r used for both in-line and round IC's (top & bottom views). Another approach is shown in Fig. 3. Here, a 14-pin dual in-line socket is mounted on a board, with a suitable number of terminals around the edge. The circuit can then be built up between the socket leads and the perimeter terminals. Figure 3 also shows how a round TO-99 case can be inserted in the socket, with the pins properly mated. Typical Applications. Although only a few circuits will be described here, they are basic to all of the many variations that are found in this and other publications. 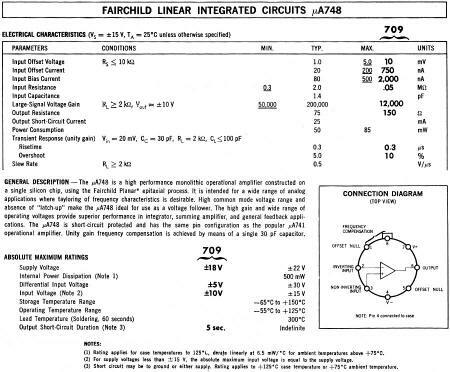 Note that, although some of the circuits shown here do not have compensation, it is always necessary to compensate a 709. This is not true, however, of some other op amps so the specifications should always be checked. The two dc voltmeters shown in Fig. 4 illustrate some interesting points. In both circuits, the 5000-ohm output resistors can be changed to affect the basic circuit sensitivity. For example, making this resistor 1000 ohms gives both voltmeters full-scale ranges from 0.1 to 100 volts. Circuit A would then have an input sensitivity of 100,000 ohms per volt, but circuit B would retain its original 10-megohm input. Circuit B also has a null balance circuit since the typical offset of a 709, multiplied by the gain of 100, would produce a significant zero offset on the meter. In this case, with the input shorted, the null offset potentiometer is adjusted to obtain a zero on the meter. Such a voltmeter would be ideal not only for solid-state testing (since it has the necessary low-voltage scale), but also for vacuum-tube circuits where the dc voltage could reach 500. 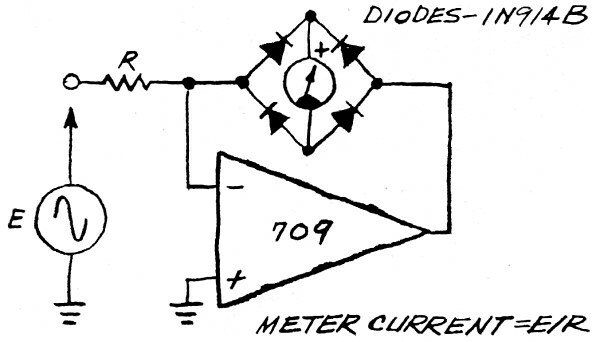 A very linear ac voltmeter is shown in Fig. 5. In this circuit, diode nonlinearity is minimized by the high gain of the amplifier. Sensitivity is the same as that of the meter: that is, 1000 ohms per volt for a 1mA meter. 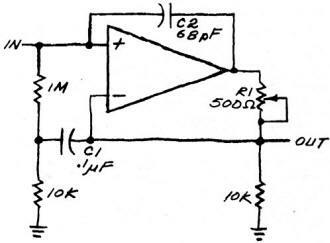 A higher input impedance can be attained by using an op amp buffer in front of this circuit. 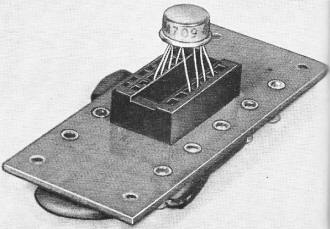 The current-to-voltage transducer shown in Fig. 6 makes use of the current sensitivity of the op amp to measure very small currents. As shown, the circuit indicates 1 volt per microampere and is capable of 0.1-microampere sensitivity. Resistance values for R1 can be between 100,000 and 10,000,000 ohms to provide outputs from 10 μA per volt to 0.1 μA per volt. The circuit shown in Fig. 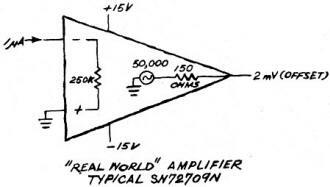 7 is an example of just how far you can go in creating an ultra-high input impedance with an op amp. Developed by NASA, the circuit has an input impedance of several hundred megohms with an input capacitance of less than 1 picofarad. The high impedance is obtained by positive feedback through C1. The input capacitance plus the capacitance to ground can be cancelled by adding feedback capacitor C2 and properly adjusting R1. The low-frequency response is determined primarily by C1, for which an electrolytic capacitor may be used. High-frequency response is limited by the op amp. With a square wave applied to the input, potentiometer R1 is adjusted to obtain a square wave on the output (similar to making a scope attenuator adjustment). 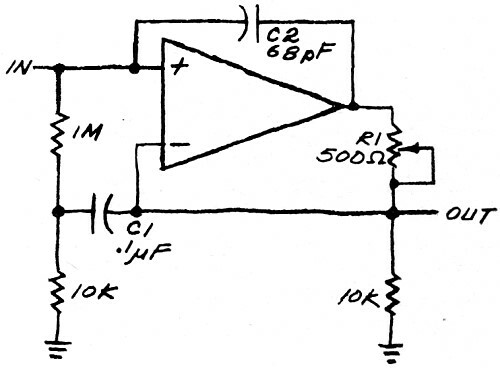 The circuit was designed to amplify a 5-μs pulse coupled through a 1-pF capacitor. The slew rate is approximately 0.5 volt per microsecond. Two gain-control, or variable-attenuator, stages are shown in Fig. 8. 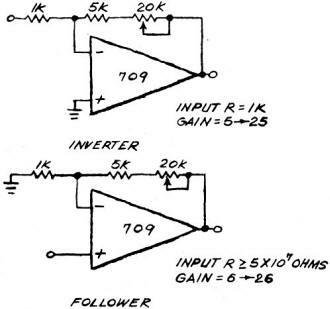 Note that two different input resistances are shown - one very high, the other low - and that the gain of either stage can be varied by changing the feedback circuit. A word of caution: when the feedback potentiometers are at their minimums, the effective load on the amplifier is 5000 ohms. Be sure that the feedback resistors do not "use up" all the available output current. Fig. 4 - A pair of dc voltmeters using an op amp. The circuit at (A) is 20,000 ohms per volt, while that at (B) is 10 megohms per volt. Text discusses design changes to improve this simple design. In both cases, the meter has a conventional 0-1-mA movement. An interesting use of the op amp is in frequency-selective networks. With conventional discrete semiconductor circuits, it is usually necessary to use large inductors to perform this operation at low audio frequencies. In the circuit shown in Fig. 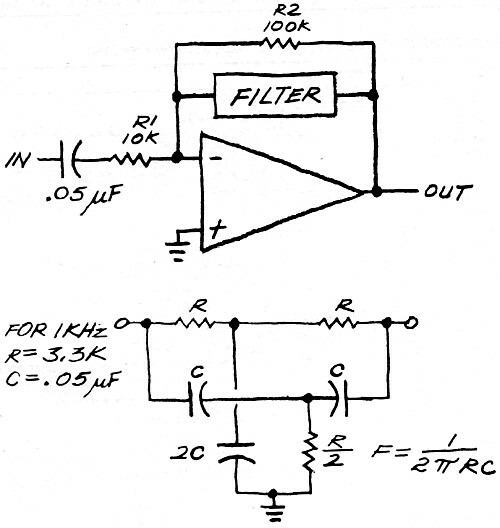 9, a twin-T filter (which has a resonance similar to its LC counterpart), is used in the feedback circuit. Figure 9 shows the method of calculating the element values for any frequency. 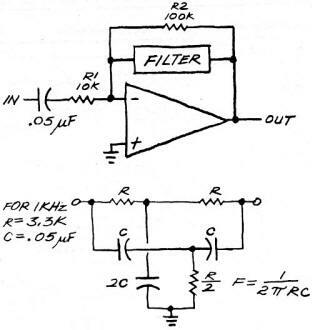 Unfortunately, the Q of a twin-T filter is rather small - on the order of 0.25; but, when combined with the gain of the op amp, the Q is a reasonable value. Using an amplifier with a gain of 10, the Q is 2.5; and with a gain of 40, the Q is 10. Thus an op amp, with a few passive components, can be used to simulate a bulky, expensive inductor; and it has the advantages of a center frequency and Q that are easily controlled over a wide frequency range. Another audio filter, this one generating a notch at the selected frequency and having a variable Q, is shown in Fig. 10. The input to the positive terminal of the op amp is combined with feedback through the bridge-T network. The other input is variable. When the signal levels at both inputs are equal, there is no output from the amplifier. System gain is still R2/R1. By adjusting the "SET" control, a small notch at the filter frequency is obtained. As the "Q ADJUST" control is brought near the filter end, the feedback increases, controlling the Q of the circuit. 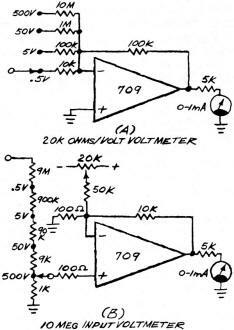 The frequency is determined by the values of the filter capacitors and the setting of the ganged potentiometers. Performance Limitations. Input limitations are applicable primarily to follower configurations, provided, of course, that input overloads are avoided. The summing junction of an inverter remains at ground except when fast voltage spikes or extremely high voltages are applied. In the first case, feedback is too slow to protect the summing junction; while in the second case, the output stage saturates and is unable to divert the input current. In followers, the summing junction moves in step with the input voltage so that, in some circuits, the input must be restricted to 15 volts. In Fig. 4B, for example, the divider restricts the summing junction excursions until the output stage saturates. The amplifier has a gain of 100 (101 if the resistor values are exact), and an input in excess of 0.1 volt would saturate the amplifier at an output over 10 volts. 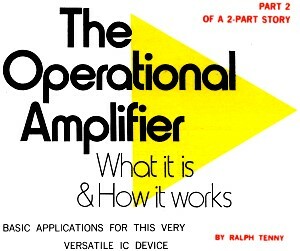 If a 10-volt input were allowed, the summing junction would be driven so high that the input transistors in the op amp would probably be destroyed. Fig. 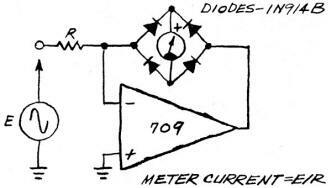 5 - Typical ac voltmeter basic circuit using an op amp. Although the input impedance is only 1000 ohms per volt, by adding an op amp buffer in front, impedance can be raised. Fig. 6 - This current-to-voltage circuit indicates 1 volt per microampere and is capable of at least 0.1-microampere sensitivity. Fig. 7 - This circuit, developed by NASA, has an input impedance of several hundred megohms with an input capacitance of less than 1 pF. Fig. 8 - A pair of variable attenuator circuits. 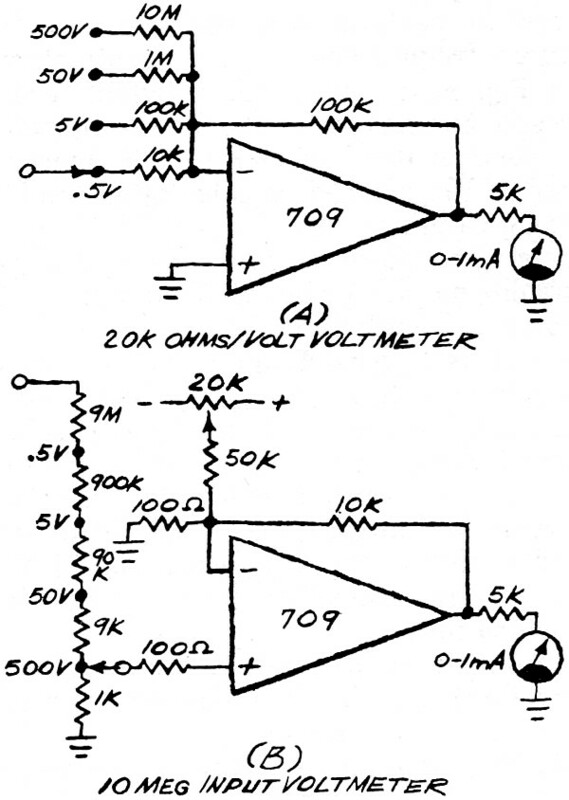 The upper one has an input resistance of 1000 ohms, while the bottom circuit has a 50-megohm input. Gain is very similar. Performance limitations having to do with offset voltage and current are largely inconvenience factors. External null circuits balance out offsets over a small range of ambient temperatures. Offset effects (as well as open loop gain and input resistance) vary with ambient temperature, so circuits that must operate in changing temperatures should be designed around amplifiers with low offset. Op amp circuits with low values of R1 and R2 are not bothered by offset currents, while circuits with low closed loop gain suffer little from offset voltage. For special applications, where extreme accuracy and/or stability is needed, it is important to consider not only the open loop characteristics of the amplifier, but also the accuracy and temperature stability of the external components. Fig. 9 - A frequency selective network in the feedback loop of an op amp can simulate an LC circuit having a high Q at audio frequencies. Both Q and center frequency can easily be changed by varying the RC values. Fig. 10 - This audio filter permits changing both Q and center frequency via pair of controls. In choosing an amplifier for a given application, the manufacturer's specification sheets should always be consulted. Unfortunately, these sheets often contain an amazing amount of information - which may be confusing to the uninitiated. 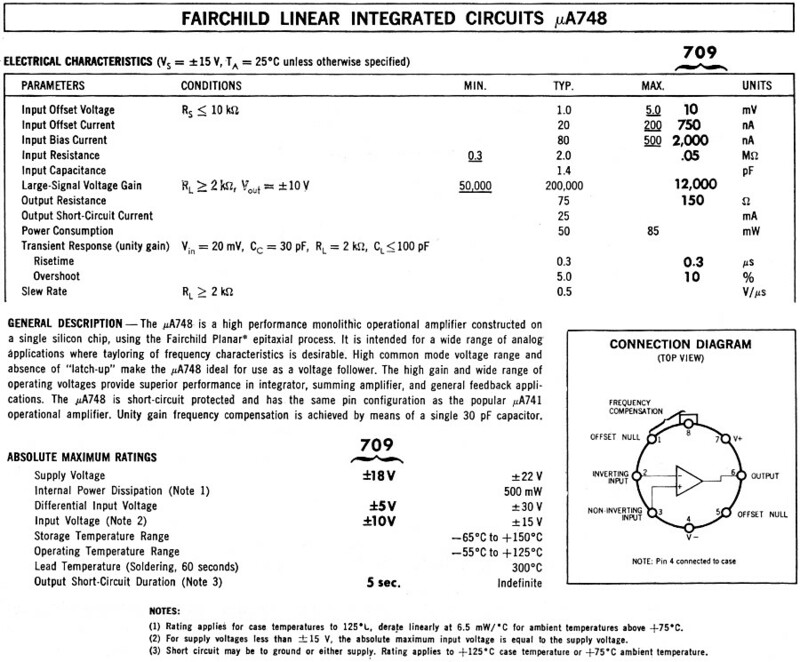 Figure 11, for instance, shows part of the information given on the Fairchild μA748 op amp. Note the two columns headed "709" which have been added to the illustration for comparison purposes. Some of the performance figures have been underlined. These are "worst case" conditions and should be used in circuit design. Also note that some specifications are accompanied by "conditions" (such as a specified load resistor). When comparing amplifiers, these conditions must always be identical. All specifications are always for the open loop configuration unless otherwise noted on the sheets. By now, you should have a pretty good idea what an operational amplifier is and how it is used. The next step is to keep your eyes open as you review the technical literature and be aware of the wide variety of op amp circuits available. Then put them to good use. General Description - The μA748 is a high performance monolithic operational amplifier constructed on a single silicon chip, using the Fairchild Planar* epitaxial process. It is intended for a wide range of analog applications where tayloring of frequency characteristics is desirable. High common mode voltage range and absence of "latch-up" make the μA748 ideal for use as a voltage follower. The high gain and wide range of operating voltages provide superior performance in integrator, summing amplifier, and general feedback applications. The μA748 is short-circuit protected and has the same pin configuration as the popular μA741 operational amplifier. Unity gain frequency compensation is achieved by means of a single 30 pf capacitor. Fig. 11. This is a portion of the specifications sheet on the 748 op amp with the "worst case" parameters underlined. The specs of a typical 709 have been added for comparison purposes.